That is 12 months old? The media are in a frenzy of self-justification over the Mueller report. So sad. Journalism was once an honest profession. Why won’t the facts just fall into line with what they want to report? can’t get over the ‘love’ for Trump…down here in NZ. 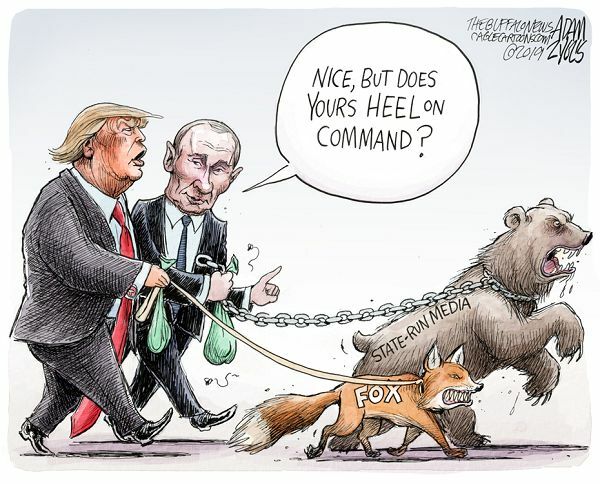 The Dems have a fox hunt pack, B. And still lost. Trump is a complete douche Blazer. His low brow ignorant ramblings which should have had him ready to be cast aside have only been overshadowed by the utter incompetence and ongoing duplicity of the media who have somehow managed to turn him into the victim. The US media have given Trump a better than even chance of being re-elected due to their groupthink and failure to properly report on facts instead of wishes. They haven’t done their jobs and it is biting them in the arse big time as Trump’s main election platform – that the media is the enemy – has been found to be true. This is the legacy our white supremacist murderer has left us. This type of discussion will be off the table even though this chap is Arab and I presume, a Muslim. The irony is because of the Christchurch terrorist attack many won’t heed his warning. There are two sides to terrorism. Interesting comments below the video. Can’t you have the decency to wait until the murder victims are cold in their graves (as the saying is) before you start spouting this sort of thing ? Have you no shame or decency at all ? The blood is dripping from your hands. I’m going to try commenting here one last time. Hopefully the censorship has dialed back a bit. Firstly, I’ll try once again to mention on here that four times as many Christians perished in Nigeria at the hands of Muslims in the same week as did Muslims in Christchurch by this nutbar. I just want that put out there. Maybe the moderators don’t like that inconvenient fact, but it’s true. But to address the post, I couldn’t disagree more. The shooter has been wildly successful. He has brought repression, censorship and fascism to New Zealand, while chilling ANY valid criticism of the ideology known as Islam. He brought censorship to this blog. He encouraged the worst impulses of the left. How else would Islamic prayers get put in Parliament and on TV? He has inflamed hatred between people. The vigils have been turned into SJW cultural revolution shaming rallies. Evil is triumphing in New Zealand and people that ought to be standing up to it are not. If something this tame gets censored, then my days of commenting on that site are over. Were you on the unmoderated list commenting under your own name list, Blair? I’ve always used BlairM to comment on Kiwiblog, and my profile has my full name. At the moment I seem to be automatically under moderation, but some comments have appeared and some have not. It seems like *anything* negative I say about Islam is getting bounced, although negative comments from others seem to have been allowed. You have to email a request to get in the unmoderated list as a real name poster. To editor@kiwiblog.co.nz. Yeah… I’ll give that some thought. I find myself disagreeing more and more with Kiwiblog content these days, and commenting is just not as fulfilling. I’m personally and politically offended by the dhimmification of the site after the shootings, enough to take my leave. I was surprised at how little I missed commenting on WhaleOil when they banned me three years ago (although I did comment incognito under SaggyNaggy for a while). I suspect Kiwiblog will be no different. Something significant has prompted Farrar to take the steps he did. Without knowing what it’s hardv to judge, but there have been many unfettered knarly comments at Kiwiblog over the years. There’s a lot of responsibility running a prominent blog, both legal and social. Many in media have been rocked by what happened in Christchurch, with various changes being made. If I thought that this site may have contributed in any way to fifty murders and forty two attempted murders I’d have taken drastic action. As it is I have considered shutting down and walking away – it’s far simpler to close your eyes and your forum. For now i have decided that good discussion is important, even on a small scale, and people need to be able to express their feelings and opinions on something that has so much impact. I’m not going to allow YNZ to be overrun by pessimsim and stirring division an intolerance. While there are things I could quibble with I’m mainly very supportive of what Ardern, the Government, Muslim communities and wider communities have done in reaction around the country. I think that claiming a Muslim takeover due to one prayer in Parliament, after over a century of Christian prayers in Parliament, is just nonsense, a gross overreaction. Farrar is first and foremost a political animal. Have you seen any support from his political masters for your stance? I think the National Party has said heel. I’ll leave this comment as is so you have an opportunity to say it, but I disagree with fairly strongly on most counts. There has been some of that (prompted rather than encouraged), but largely a continuation of what has been happening. What was done also prompted a lot of crap stuff from the right too, as haas been evident at Kiwiblog (what has been allowed through) and especially at Whale Oil. Evil certainly reared it’s head big time in Christchurch, but that has largely been overwhelmingly been overshadowed by good. There has been overreactions, and opportunism to stir things up (as was the killer’s intention), but I think there has been far more good on display around the country than bad. That’s what I am standing up for. Looking to make good from somethi9ng terrible is surely better than stirring a pot of disunity and hate. There are certainly elements of “Never let a good crisis go to waste” around but I agree the overwhelming sentiment has been positive and healthy. We just need to keep an eye on the politically motivated near power. What you say may possibly be true at a grassroots level, but frankly, I’ve seen very little in the media that is positive. New Zealand overnight became a place where people have to watch their mouths, and if you say the wrong thing on Facebook, the police will come calling. Whitcoulls pulling the Peterson book was the most ridiculous reaction. And the Auckland vigil was a disgrace worthy of 1960s China. Standing up for the good is commendable, but it actually involves calling out the evil and fighting it. People seem afraid to do that right now, and that scares me. I think that’s a time and place issue. The tragedy is still raw. There has a been a great deal of compassion and acceptance that has come out of this which can only be a positive. There has also been barrow pushing and taking advantage of the situation to push political agendas. I agree it has been mainly on the left – Marama Davidson being the greatest offender IMO, with Golriz not far behind. But the right have had their moments too, particularly with being tone deaf. The time for pushback on the negatives is after the dust has settled and the grieving process had its time. I completely disagree with you on the Islam and prayer comments. I have little liking for this government, but the show of compassion and unity was underscored and amplified with the hijab, the prayer, the translations into arabic and other gestures that showed Islam is not “other” but can be part of the NZ landscape and should not be a source of fear. Claire Trevett wrote an excellent article on the impact of these gestures in terms of diplomacy. The gestures are circumstance specific and hardly the harbinger of a great Islamic takeover. The Dunedin vigil was very good, even though it was heavy with prayer, a bit alien for an atheist like me. I picked up one aspect of the Auckland vigil that I had serious concerns about, Marama Davidson’s speech, and posted my criticism of it. The police haven’t come calling. She and others who used it as an excuse for grandstanding and spouting political views were very wrong. It was supposed to be a vigil, not a political rally. The idiots who chose these speakers should have had more sense.I would have been among those who walked out. Fellow columnist Joe Bennett wrote this week that the “oldest instinct of our species is that the alien is both inferior and a threat. The instinct lurks even in the nicest of us and it won’t go away. It’s what gives pep to an All Black test”. By letting us into their lives, the Muslim community in Christchurch has helped break down barriers that should never have been there in the first place. The shooter has, for the moment, achieved exactly the opposite of what he was hoping to do. Instead of the discord and hatred he was hoping to sow, his killings have created a closer and more cohesive Christchurch and New Zealand. He has shattered the conceits we have about our safe and green country but he has also put in neon lights the dangers of our tendency to dehumanise members of our community because they worship differently or don’t look like us. From this loss of innocence, something stronger may grow. David Farrar: Was the Christchurch attack the least successful attack in recent history? I don’t mean unsuccessful in terms of killing people. Sadly he was successful there. The loss of life was appalling and we won’t forget the victims. What I mean is that in terms of his objectives, he has been a miserable failure. In fact he has achieved almost the polar opposite of what he aimed to do. He said that he decided to attack Muslims in New Zealand because (his words) they are the most despised group of “invaders” and attacking them will receive the greatest level of support. Well he has achieved the opposite. He has done more to foster goodwill and empathy for Muslims in New Zealand, than many would have though possible. The 50 victims have been the human face of what happened. Almost $10 million has been donated to their families. Tens of thousands of New Zealanders have attended memorial services. The words of mosque leaders preaching peace and tolerance have been heard up and down the country. Muslim prayers have been said in Parliament, on television and radio. Again this is the greatest backfire I can recall. The overwhelming reaction from New Zealanders has been the total opposite to what he wanted. His other aim is to help incite global war by sparking revenge attacks against New Zealand. But again the opposite has happened. To the rest of the world, New Zealand has been the victim not the perpetrator. So once again he has scored an incredible own goal. He has probably done more to frustrate his own aims, than anyone else could have done on purpose. That doesn’t lessen the tragedy for the 50 dead and their families. It doesn’t lessen the fear that many Muslims will have in having been targeted in this way. It goes without saying that we would all be better off if he had somehow been detected before he could launch his attack. But the fact his hatred has backfired so massively in terms of his aims, is some comfort I hope. That may explain a little about DPF’s moderation aims.